When I was a kid, trees were my monkey bars, from the short mimosa with low, spreading branches to the oak tree that was just right for shinnying up. These ubiquitous giants have been my silent, constant companions: the familiar trees in my home state of Virginia; the scattered, sometimes scrubby trees in the great American West; and the diverse flora I’ve discovered on my travels around the world. When I had kids of my own, I made it a point to share my appreciation with them, knowing that such value is the basis for protecting our natural resources. Like many Richmonders, I mourned the loss of thousands of area trees during Hurricane Isabel in 2003, including more than eighty large and historic trees in Hollywood Cemetery. The grief we feel after such a calamity shows that trees mean more to us than their uses for paper and lumber, fruits and nuts. We derive pleasure from planting new trees, nurturing them, admiring their beauty, playing among their trunks and branches, and resting in their shade. The last Friday in April is Arbor Day, when we can give trees our full attention, teaching our kids about their importance and planting young saplings to treasure for years to come. The Chesapeake Club launched the Plant More Plants! Initiative to encourage Virginia families to do just that. At PlantMorePlants.com, you’ll find planting tips and other resources, including a list of plants that are native to Virginia. These are the best choices for Richmond yards, since they use less water and fertilizer and are typically more resistant to insects and disease, thus better for the environment and easier to maintain. Your family can get ten free trees that grow well in Virginia from The Arbor Day Foundation (ArborDay.org), where you can also donate to replanting programs in forests in the United States and around the world. Locally, this spring, some Richmond-area third graders will be participating in Project Plant It! The award-winning program, sponsored by Dominion in partnership with the Arbor Day Foundation, teaches elementary school children about the role of trees in our lives and how to recognize and care for trees, while connecting the information to state learning standards. In the classroom, teachers receive instructional materials, worksheets, puzzles, and educational posters. The participating students receive certificates as well as a tree sapling of their own to plant and care for. If you do plant a tree at home, remember to follow Dominion’s important safety guidelines: Don’t plant trees underneath or within twenty-five feet of an overhead power line. Also, call 8-1-1 before you dig to ensure that you don’t plant trees on top of underground power, cable, phone, or gas lines. Most of the trees already growing in your yard look fantastic, right? But that’s not all they do. They also provide shade, windbreaks, homes for birds and squirrels, and handy foundations for tree swings and tree houses. The leaves and pine tags that fall, though annoying to many, can be used for compost and mulch. Plus, it will be time for jumping and playing in autumn leaf piles before you know it. The public health benefits of trees in neighborhoods and cities have only recently been recognized. Decades ago, trees were cut without regard to long-term results. Though Monument Avenue is now lined with stately trees as well as houses, a photo of the area in the late nineteenth century shows not only an empty thoroughfare, but expansive, adjacent fields devoid of both. Recent studies examining the human stress factor in urban areas have demonstrated that viewing nature can help reduce stress. Hospitalized patients who can see natural landscapes and spend time outdoors actually need less medication, sleep better, and recover more quickly. Forested neighborhoods have less crime and pollution, better noise buffering, and reduced energy costs. In business areas, workers with views of nature report fewer sick days and greater job satisfaction. Urban trees are good for the environment, too, as they reduce storm water run-off and pollutants, prevent erosion, cool and clean the air, produce oxygen, and reduce atmospheric carbon dioxide. Recognizing these benefits as well as trees’ beauty, local governments and property developers have planted trees and shrubs, and neighborhoods have landscaped their entrances and common areas. Local organizations, including Venture Richmond and the City of Richmond, have added landscaping, flowers, and planters downtown along Broad Street and the 400-block of East Grace as part of a beautification project for the Arts District. In celebrating the benefits of landscaping in urban areas, though, we mustn’t overlook the well-established benefits of trees as the ultimate renewable resource. Many products are made from trees, like paper, books, furniture, and houses, and even toothpaste, ice cream, chewing gum, and soap. Fortunately, trees can be replanted, providing shelter for wildlife and protection for the environment as they grow. Virginia has many working forests, which are actively managed for harvesting trees as crops. “Most of Virginia’s forests are privately owned, many by individuals and families and small companies – over 300,000 owners and 11 million acres,” says Dean Cumbia, director of Forest Resource Management for the Virginia Department of Forestry. “The forests provide products and income for owners through timber harvests, which allows owners to maintain their lands, and provide for needs like education, healthcare, and housing. Your family can take a guided audio tour of one of these working forests at the Appomattox-Buckingham State Forest, about an hour-and-a-half from Richmond. Visiting state and national parks and forests can remind you of another important benefit of trees: For many woodland creatures, trees provide habitat – sources of shelter and food. Many of these animals would not survive without that particular habitat. Since one of the best ways to build value is through experience, you and your family can spend time together appreciating these beautiful and useful natural resources. Besides visiting parks and forests, you’ll want to enjoy trees up close. By climbing trees and playing in forest canopies, your kids can experience these giants as their playground. If you’re lucky, you have a tree in your yard that’s perfect for climbing. 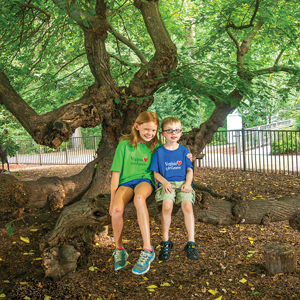 If not, Beth Monroe, with Lewis Ginter Botanical Garden, recommends a spectacular and old red mulberry tree in the Children’s Garden. 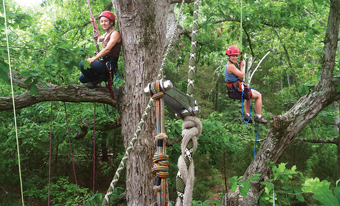 The trained guides from Riverside Outfitters can take you tree climbing safely, modifying the level of challenge for climbers age five and up, giving families the chance to tackle vertical climbs, limb walks, zip lines, tree swings, and other natural, outdoor challenges. For more treetop adventure, you can visit Metro Richmond Zoo in Moseley. The zoo’s Treetop Zoofari course takes visitors from tree to tree, up to forty-five feet high in the forest canopy, along zips and obstacles, and even above the zoo enclosures for a bird’s eye view of monkeys, kangaroos, giraffes, antelopes, and other animals. Their Junior Explorer course goes only twelve feet high. In Williamsburg, the Go Ape! 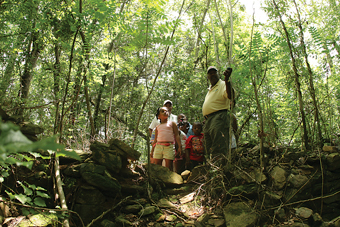 Adventure course in the trees of Freedom Park has thirty-seven crossings to navigate and five zip lines, with options to choose skill levels along the way. Go Ape also offers a course for junior visitors under ten. One of the biggest take-aways from any of these canopy experiences? How incredibly strong and durable trees are! They’re perfect for lumber used for furniture, decks, and homes – and, in years past, for sailing ships that could cross oceans – and they can support your family during an afternoon of recreation. Once you’re back at home, to connect your child with the value of trees, how about a hunt for items made from wood? Or you can read a book about trees – made, of course, from trees. Try one of these: This Tree Counts! By Alison Formento which teaches appreciation for trees and basic math, for ages 4 to 7; Planting the Trees of Kenya: The Story of Wangari Maathai, by Claire A. Nivola, about the Nobel Peace Prize winner who founded the Green Belt Movement, for ages 5 to 8; or Tree Crazy, by Tracy Gallup, recommended by the Arbor Day Foundation, for all ages. When a lesson is wrapped in enjoyable memories, the values imparted are rooted even more deeply. Whether exploring forests and parks, your own backyard, or the tree products in and around your home, Arbor Day activities not only help your child appreciate trees, but connect them to the warmth of family. All trees are valuable, but some are downright exceptional! The book, Remarkable Trees of Virginia, showcases the state’s oldest, largest, and most unique trees. For instance, you’ll find both the oldest and largest trees in Southampton County: bald cypress that are more than a thousand years old. One of these, Big Mama, is twelve feet around and 123 feet tall. Embark on a tour of remarkable trees near Richmond and share your adventure. Tweet your family tree pictures to @RVAFamilyMag with #RVATreeTour. Maymont. 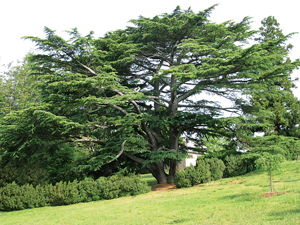 The Dooley’s glorious estate has 173 species of trees from five continents. Most are labeled, for easy identification. Hollywood Cemetery. Established in 1849, the historic burial park has over 1,000 trees, including fifty “monarchs,” large old trees that are still standing strong. Lewis Ginter Botanical Garden. Be sure to check out the Woodland Walk, with native shrubs and trees, and the large, sprawling red mulberry tree in the Children’s Garden that kids are encouraged to climb on. Gingko trees along Massie Road in Windsor Farms. These remarkable primitive trees are relatively unchanged since the Triassic Period 200 million years ago. The gingko stands out because of its unique fan-shaped leaves and strikingly beautiful yellow fall foliage. The willow oak at Boulders III in Chesterfield. This massive, 230-year-old tree shows that progress doesn’t have to destroy nature. Understanding the importance of the tree, developers protected it during construction and have cared for it since. The Edgar Allan Poe hackberry tree. 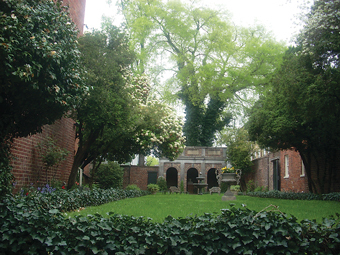 The Enchanted Garden at the Poe Museum on Main Street opened in 1922, crafted based on descriptions in Poe’s poems. The garden’s hackberry tree has grown quite large and has “fathered” historic Poe hackberry trees planted elsewhere in the United States. The tricycle tree at 505 Center Street in Ashland. Two young brothers in 1908 fastened a tricycle in the limbs of this huge old willow oak to hoist treasures up to their tree house – the wheel is still there, embedded in the wood. The massive American sycamore tree outside of Sycamore Tavern in Montpelier. This tree has been in front of the historic building since the seventeen hundreds, witnessing centuries of community events. Otherworldly cypress trees. The knobby knees and gangly roots of cypress trees growing beside swampy waters seem purely primitive – you’ll almost expect a pterodactyl to swoop down at you! To see these mysterious trees up close, visit First Landing State Park or the Great Dismal Swamp and Lake Drummond. Annie Tobey is a Richmond-based freelance writer and editor. She is the mother of three - twin sons and a daughter - and enjoys running, hiking, and kayaking.